Sometimes we get exclusive figures, sometimes we get sneak peeks with exclusive gear. 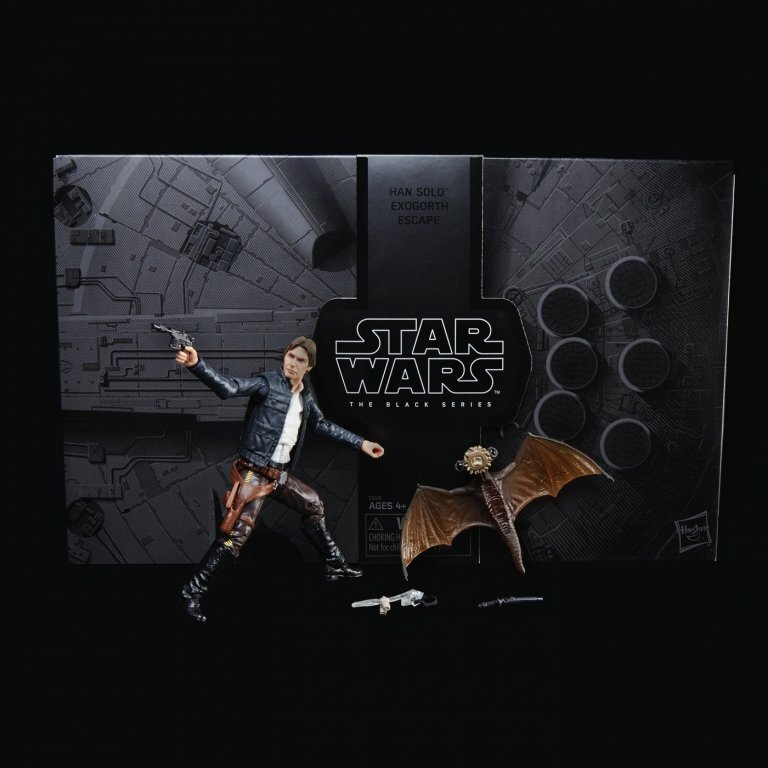 The STAR WARS: THE BLACK SERIES HAN SOLO AND MYNOCK figures are a surprisingly fair $34.99 in a big fancy box that recalls the awesome Boba Fett from 2013. 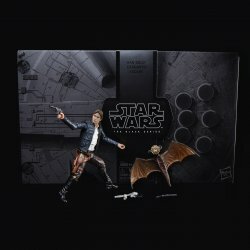 Han has a breathing mask, Mynock, and some other goodies. The box reads "Exogorth Escape," and if that seems baffling that's because you missed the Knights of the Old Republic comic books that gave a name and backstory to the big space slugs. Mystery is dead, but the hunt lives on - more pictures and press info after the break. It's pretty dang cool. At this time we do not know if this is the final exclusive or what else Hasbro has planned - for the last two years, we've been treated to surprise exclusives on the day of the show. You might not even know what you're missing when you're on the show floor. 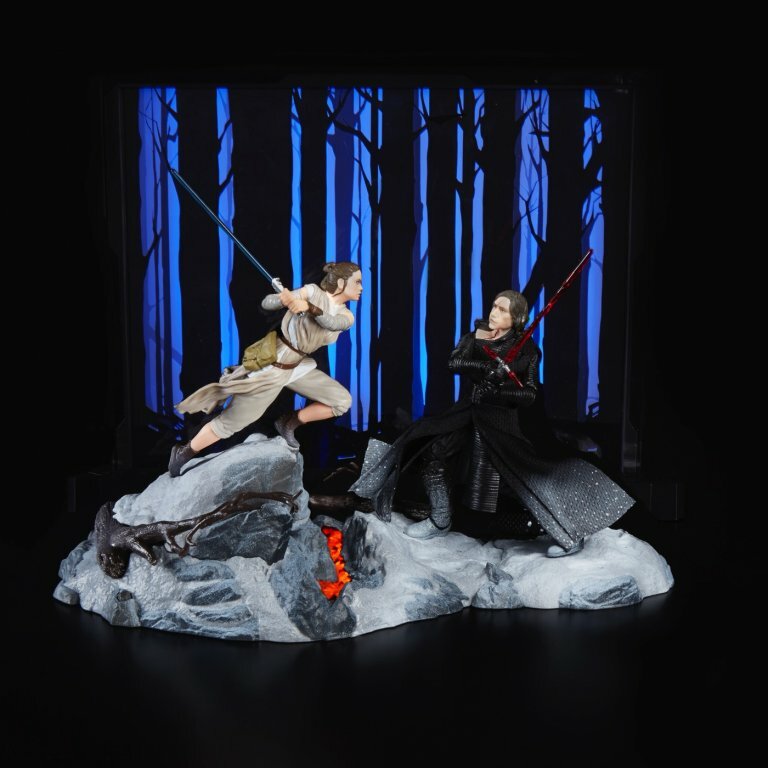 We got a Rey in 2017 and an unmasked Kylo Ren in 2016, so in 2018 we get STAR WARS: THE BLACK SERIES CENTERPIECE REY (STARKILLER BASE) & KYLO REN. The Centerpiece Rey is available here for the first time, and Kylo Ren appears to be retooled from previous releases. The Rey is a Centerpiece, meaning lights are yes and articulation is no. There's a misting system and a fancy light-up backdrop. Kylo Ren has a uniquely expressive face, a torn shirt, and lots of articulation. Also snow deco. The set is $109.99. More images and the press info after the jump. Star Wars Doctor Aphra Action Figure Set from Hasbro Debuts at SDCC! With three figures and a bit of sticker shock, this year's first (possibly only) 3 3/4-inch Star Wars Comic-Con exclusive in San Diego has been revealed! Doctor Aphra is joined by 0-0-0 and BT-1 from Marvel's Doctor Aphra and Darth Vader comic books. They're good fun, and those who read the stories have been requesting the Doctor and especially her droids for years. It's more or less just different enough to make you mad! The K-2SO (Solo: A Star Wars Story Line Look) has a sound chip and slightly better antenna on the back - but it's functionally very similar. Read on! Hopefully you saw the movie, because today we look at Chewbacca (Solo: A Star Wars Story Line Look)! This awesome figure has a unique bandolier and a decent paint job. And it's probably sold out at a store near you. Read on! Packaged in a red and white box with The Last Jedi hues but shipping in the Solo assortments, the most-articulated Wampa yet is out in the Force Link 2.0 assortments - but at press time, the app and Force Link band require an as-of-yet unpublished firmware update to make it talk. (We got one update to get most toys working, this one still doesn't.) 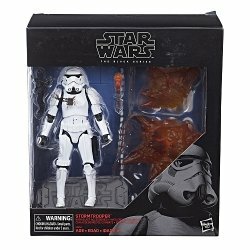 There are a lot of weird, wrong things about the toy's sound chip and box, but the jointed knees and elbows will get you your best Wampa yet. Read on! 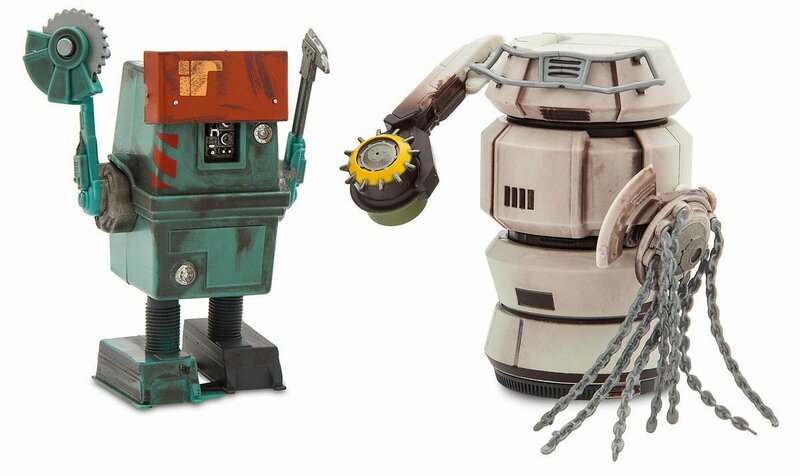 Disney theme parks are selli Solo: A Star Wars Story - Wind-Up Fight Droids for $9.95 (plus shipping). The Astromech 4-pack isn't online at this time - I still need to get one, myself - but this 2-pack is. The listing says they're 3 3/4-inches, so I assume that means they'll fit nicely next to Hasbro figures. Order yours here. One of the more highly-requested figures after The Force Awakens came out, Supreme Leader Snoke has had a pretty good recent run as action figures. This one has a cloth outfit and a generous slathering of articulation, and it's also the only completely new figure in the new 2018 The Vintage Collection so far. As such, you're probably on your way to buy one. Read on! I'm a fan of this Finn, in part because it's exclusive where I work and in stock right now. He has a great sculpt, a good costume, and above par accessories - and the voice clips are actually him. Sure, some are from another movie, but it's something. Read on!